We have been providing a service and supplying parts for all types & makes of fishing rods for over 2 years. We have an ever growing spare part inventory. 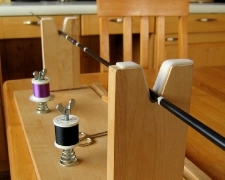 All rods are whipped by our custom rod bulider . A full report/ quotation will be given on repairs / Whipping Rods . Rods can be sent to the shop address with a full description of what the problem is. Make sure your package is sent recorded delivery. you will then recieve an email to let you know the cost of rod repair. Please remember to give us your details, Name,Address email & contact number. We will then require a full payment for repair this will include a postage cost. We will make sure the repair is dealt with as quickly as possibe normally takes up to 10 days maximum. Small repairs can be just a few days. If you require any more info please call Steve Shave on 0118 9449922.